One of the highlights of my Union County travels during this year's Four Centuries Weekend was a visit to the home of former United States President Elias Boudinot, in Elizabeth. 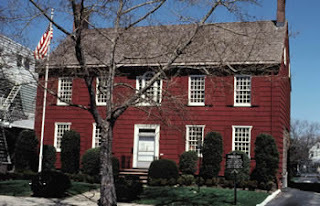 Yes, you read that right: New Jersey was actually home to a president other than Grover Cleveland, and like Cleveland's, his home is now a state historic site. The eight room, mid-18th century Boxwood Hall is now a shadow of what it was in Boudinot's time, when the mansion held 18 rooms and the surrounding property covered four city blocks. Before I get into the highlights of the house, let me clear up the presidential confusion. As you know, the 13 colonies declared independence from Great Britain in 1776, and the Constitution we're governed under was ratified in 1787. In between, the central government operated under the Articles of Confederation, by which power was concentrated in individual states, which were in a 'league of friendship' with one another. The president of Congress thus had largely ceremonial duties, and was elected by the legislature to preside over meetings and act as an impartial moderator over debates. Boudinot was the second man to hold the position, presiding between November 4, 1782 and November 2, 1783. Boudinot's historical contributions far exceed his rather brief and somewhat nominal leadership of our country. A member of the New Jersey Provincial Congress in 1775, he served as an aide to New Jersey Militia commander and future Governor William Livingston. His presidential term was just part of his overall service in Congress, as he also served three terms in the House of Representatives between 1789 and 1805. Just as I have on other visits to historic homes around the state, I ran into a few familiar names at Boxwood Hall. Our good friend Alexander Hamilton was a guest there while studying at Elizabethtown Academy, just before making a longer stay at William Livingston's Liberty Hall. (One might wonder why he moved, as Boxwood is much closer to the school. Maybe he was more taken by Livingston's daughters than by Boudinot's family?) Forming a close and lasting friendship with the young and ambitious student, Boudinot later supported Hamilton's proposed fiscal programs while in Congress. George Washington also made a visit to Boxwood Hall, not during the Revolution, but just before his first inaugural. He'd taken about a week to travel from his Virginia home to New York, which was then the capital of the young country, and Elizabethtown was his final stop before reaching the city. Boxwood Hall may be more modest in size today than it was during Boudinot's day, but it's a true gem in a city that highlights aspects of its substantial Colonial heritage while hosting a diverse, multicultural population of immigrants and first generation Americans. Two young student volunteers told me the story of the house and its furnishings, and they were clearly excited to have notable history right in their own neighborhood. I couldn't help but share in their enthusiasm, and it reminded me why it's so important to preserve and maintain places like Boxwood Hall.